UK fire safety legislation requires that, where necessary, emergency routes and exits must be indicated with signs where the use of signs will aid evacuation. Mike Sopp advises on their design, type and location. In the event of a fire, a building must have adequate emergency escape routes and final exits that enable occupiers to effectively evacuate the building, leading them to a place of safety. There are very few exceptions where escape route signage would not be necessary. However, to ensure such signage meets the basic criteria of aiding evacuation, the system design, along with type and location of signs must be given thought and consideration. It is well recognised that building occupiers usually leave the premises by the same way that they enter — or at least by routes which are familiar to them. To ensure all means of escape are utilised when required, a well-planned signage system needs to provide information on all the escape routes and emergency exits that are available. BS 9999:2017 Fire Safety in the Design, Management and Use of Buildings. Code of Practice notes that “fire safety signs and signing systems form an integral part of the overall fire safety strategy of a building and are fundamental to the communication of good fire safety management information”. More importantly, BS 9999 continues, “clearly visible and unambiguous signage is essential for speedy escape, particularly in buildings where many of the occupants might be unfamiliar with the building layout”. As noted above, there are requirements under UK fire safety legislation where necessary for emergency routes and exits to be “indicated” by signs. The phrase “where necessary” is important and indicates that the fire risk assessment completed for the premises will influence the signage system needs. degree of familiarity of the occupants with the premises. Of interest, competency criteria for fire risk assessors notes that assessors should have “an awareness of the provisions for and maintenance of, evacuation signage” but does not expand on this further to stipulate if assessors are capable of designing a system. Having determined the need for escape route signage, the responsible person must then determine who will design the system. Where required, depending on the complexity of the signage system required, the responsible person may have to seek competent assistance either in-house or externally to undertake the task in accordance with Article 18 (or its equivalent) of the Regulatory Reform (Fire Safety) Order 2005. Wherever responsibility for signage system design rests, there are several principles that should be taken into consideration at the planning stage, such as the following. Signing should provide simple identification of the means of escape to allow people to escape to a place of safety. Signing systems should cover the entire premises and potential points of confusion should be avoided. The signage system should provide clear, unambiguous information to enable people to safely leave a building in an emergency. Signs should be positioned so that a person escaping will always have the next escape route sign in sight. the lighting levels (both normal and under failure conditions). 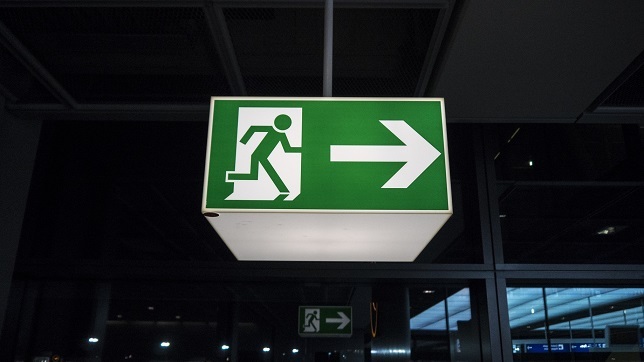 The latter point is addressed further in BS 5499-4 as this will influence whether the escape route signage system is illuminated externally (eg by the emergency lighting system) or internally. In respect of the sign design, BS 5499-4 states that “an escape route sign is a combination sign consisting of the emergency exit sign in BS EN ISO 7010 and should be accompanied by a supplementary safe condition direction arrow and supplementary text”. However, it is worth noting that Health and Safety Executive guidance contained in L64 states that “if there are fire safety signs still in use which contain symbols or pictograms which conform to the requirements of BS 5499 “they will meet the requirements of the regulations, provided they continue to fulfil their purpose effectively”. It is also worth noting that the signs’ construction, particularly in terms of their durability must be given consideration, taking account of environmental conditions that they may be exposed to. Having determined signage requirements and design, the person responsible for the escape route signage system will need to consider the position of the signs, mounting height, and the necessary dimensions. There are a number of basic rules to be followed when locating signs that are detailed in various documents, as follows. Escape route signs should take precedence over all other signs. All changes of direction in corridors, stairways and open spaces forming part of an escape route should be marked. Signs should be evenly spaced and consistently located. Signs should not be fixed to doors or sited where they could be obscured by opening doors. The effectiveness of any escape route sign should not be adversely affected by the presence of other signs conveying directional information. Additional signs should be provided where the line of sight to the next sign would otherwise exceed the recommended maximum viewing distance for the chosen size of the sign. In respect of the latter point, L64 states that signs are, in principle, to be installed at a suitable height and in a position appropriate to the line of sight, taking account of any obstacles and in a well-lit, easily accessible and visible location. This is what is known as the signs’ “required zone of influence” which is defined in BS 5499-10 as the “space in which the safety message intended to be conveyed by a safety sign is effective”. The zone of influence of any particular safety sign will be determined by the signs’ location, size and position. This may require a certain amount of calculation being undertaken in terms of viewing distances in particular of escape route signage. BS 5499-4 details how to achieve this. signs should be sited at the same height throughout the escape route, so far as is reasonably practicable. The use of escape route signage requires thought and consideration, particularly in terms of its need, the type of sign to be used, its location and effectiveness, and the ability of those close by to understand its meaning. The Regulatory Reform (Fire Safety) Order 2005 requires means of escape to be identified with escape route signs where necessary. The risk assessment will be the starting point for any signage requirement identification. Regulation 5 of the Health and Safety (Safety Signs and Signals) Regulations 1996 requires employers to provide employees with suitable and sufficient instruction and training in the meaning of safety signs and the measures to be taken in connection with safety signs. This should be provided at induction and periodically thereafter. Schedule 1 of the 1996 Regulations and accompanying guidance requires that signage must be cleaned, maintained, checked, repaired, and if necessary, replaced on a regular basis to ensure that they retain their intrinsic and/or functional qualities. For detailed information and advice, see the Croner-i topic Fire Emergency Procedures and Means of Escape. Fire safety risk assessment guidance documents are available from the Government website at GOV.UK. The following are available from the British Standards Institution. BS 5499-4:2013 Safety Signs. Code of Practice for Escape Route Signing. BS 5499-10:2014 Guidance for the Selection and Use of Safety Signs and Fire Safety Notices. BS 9999:2017 Fire Safety in the Design, Management and Use of Buildings. Code of Practice. The following is available from the Health and Safety Executive. L64 Safety Signs and Signals. The Health and Safety (Safety Signs and Signals) Regulations 1996. Guidance on Regulations. What would you do if your business was flooded?